When I was a child I read about the three pigs that built their homes – each from a different material. 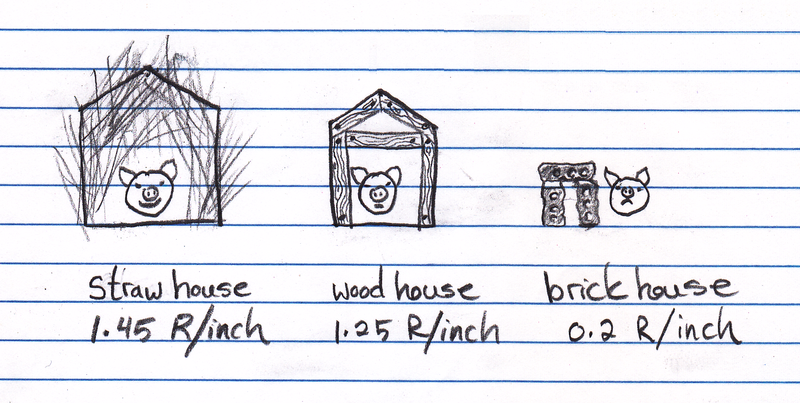 The hero was the pig who favored bricks as his home could withstand the wolf’s best attempts at demolition. While the moral may hold from a structural point of view, the opposite is true when it comes to thermal resistance. In fact, it is the straw-house pig that is sitting pretty from this point of view. 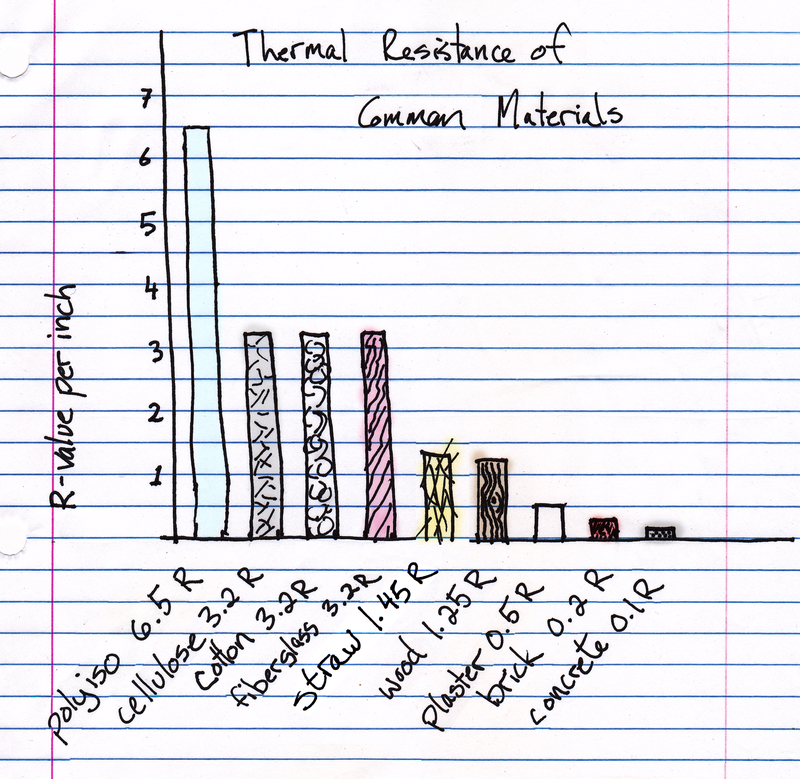 “R-value” is how thermal resistance is measured. It is the ratio of the temperature difference across a material under uniform conditions. It’s shorthand for understanding insulation worthiness of any given material. R-value per inch, allows one to compare apples to apples. In many circumstances, such as when internally insulating a townhouse in New York City, space is precious. A weaker insulator means building a thicker wall and that could mean less living space. As you can see from the chart below, common materials differ markedly in their ability to insulate. 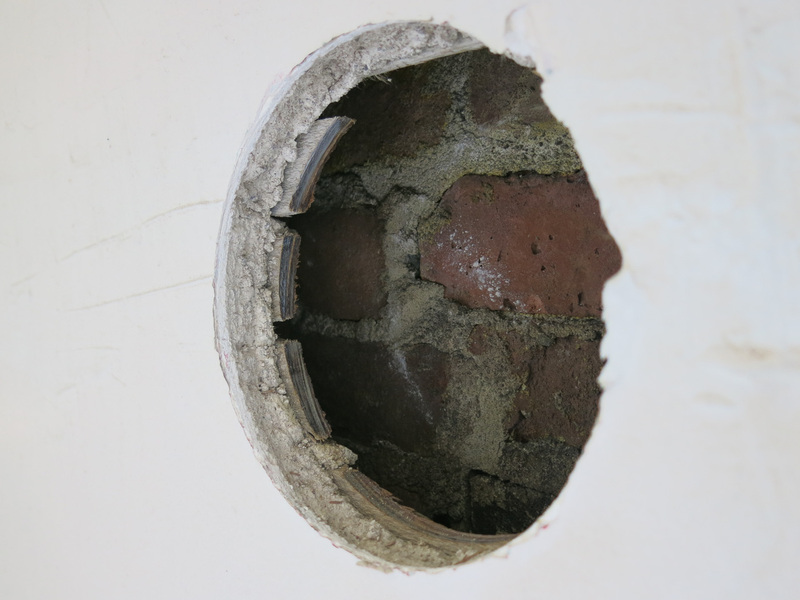 We took a hole saw to our front and back walls to take a look inside. As I mentioned in an earlier post, these walls – the external walls – are crucial to the insulation. When we add the R values of these materials together we get a total of about 5.5 R. The rear wall is similar with a little less air and, of course, no brownstone cladding. 5.5 R is not a great insulation value by contemporary standards. But as we shall see in future posts, raising the thermal resistance in an old masonry house is not such an easy task. 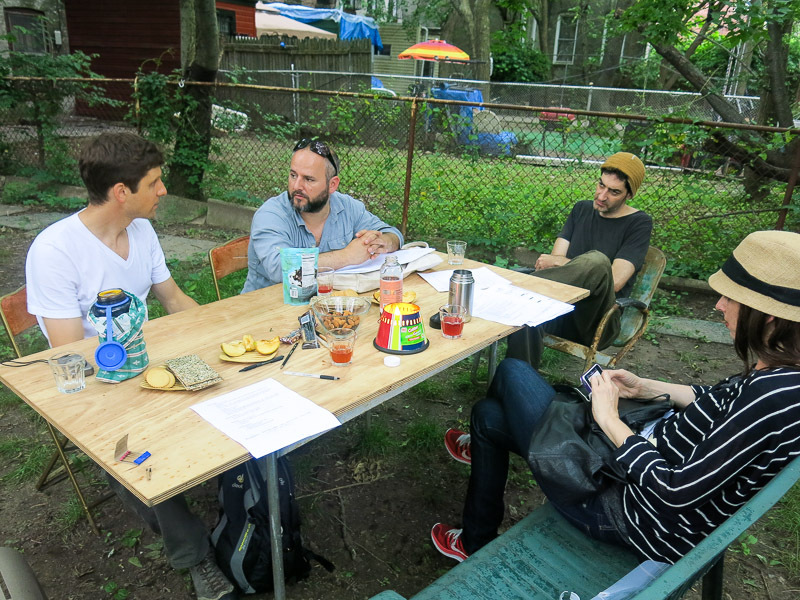 A couple of weeks ago we brought together three experts to help us brainstorm on approaches towards a budget retrofit: Thomas Brouillette, a (green) general contractor, Julie Torres Moskovitz of Fabrica718, a passive house architect, and David White of Right Environments, an energy efficiency consultant. It was a productive meeting though we did not come to a final conclusion regarding our approach. David White modeled two possible insulation scenarios: the near passive house approach and the minimalist approach. 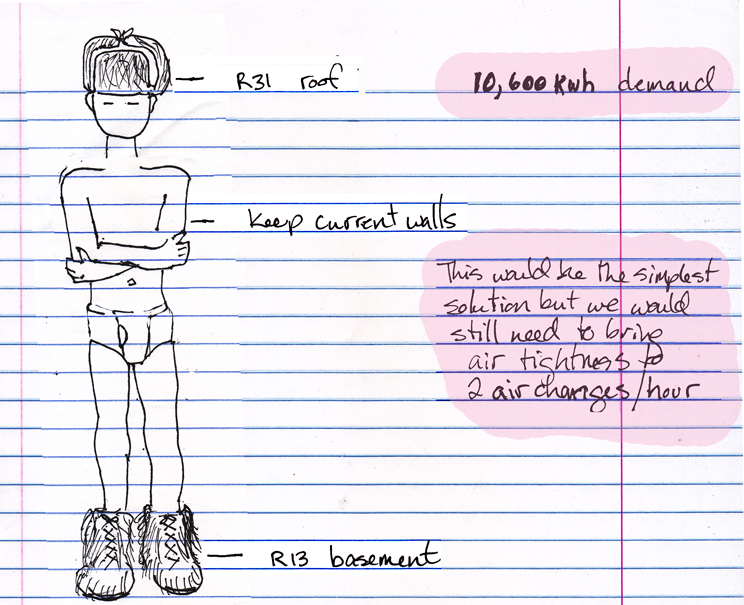 In the first example, we insulate the house to R13 in the cellar, R6 windows, R16 walls, and R31 roof. With this scenario, we would be able to use a ductless heat pump to heat the house. The end result is to get the total yearly energy consumption to about 8000 kWh per year and that is more or less what solar panels on our roof could provide. So that seems like a good target. 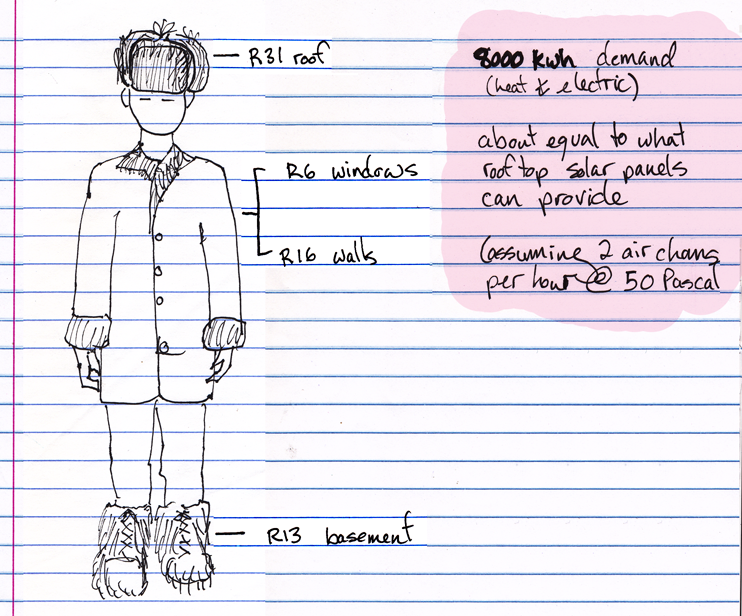 The second, and somewhat cheaper approach would be the same except to keep the walls as they are at R5.5 insulation. That brings our energy consumption to about 10,600 kWh. Much more than what it would need to get to “net zero” but not bad compared to the current energy inefficiency of the house. The main drawback of this approach is that it would not be possible to heat a house like this with a ductless heat pump – which is cheap to install and very efficient. Instead we would have to keep the existing steam system (very inefficient) or upgrade to hot water radiant heating (efficient but not cheap to install). Both models count on tightening the leakiness of the house to 2 air exchanges per hour at 50 Pascal pressure or 2 ACH50 (that’s far short of the Passive House standard for retrofits – 1 ACH50 but nevertheless a hard bar to reach) . In a previous blog I talked about the airtightness envelop. The air tightness, in practice, is measured by a blower door test and the result of this test is your air exchange value (the number of air exchanges per hour that happen at a given pressure). At this same meeting, David White did a blower door test on our house and results were astoundingly bad (around 20 ACH50). So we have a long way to go in this respect and I will be writing more about this in the future posts. Strange to think of heating with the heat wave but I’m sure this is the best time to do it. Did you end up making any cooling improvements like awnings? I think it’s great you guys are documenting as you go along because it would be so hard to remember everything after the fact. Did you guys make a decision? Did you replace the windows?